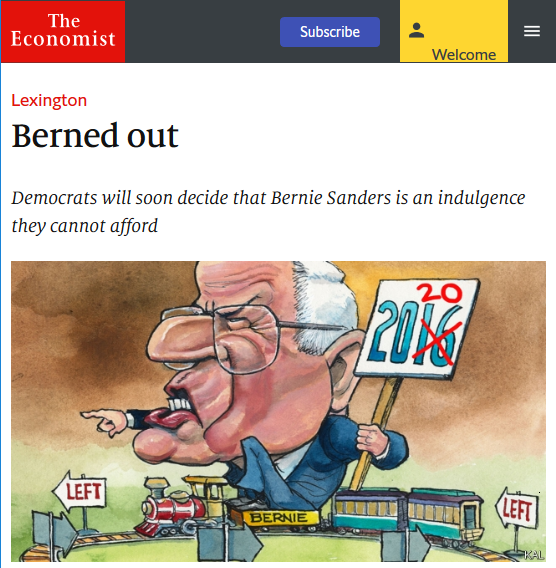 The Economist (6/7/18) writes off Bernie Sanders’ ideas as having “little support” among Democrats. was considered competitive chiefly as a result of bored journalists’ efforts to inject drama into the yawnathon of Mrs. Clinton’s slow-walk to the nomination. The first evidence for Sanders’ lack of support today is that he lost the 2016 Democratic primary to Hillary Clinton. Yet Sanders, winning 44 percent of the vote (comparable to Ronald Reagan’s 46 percent in 1976), did remarkably well, considering his disadvantages. Clinton had what was essentially a home-field advantage in the primaries, with Democratic Party machinery staffed at the time by Clinton loyalists like Debbie Wasserman-Schultz. Journalists in the corporate press hardly wanted drama: Voters were subjected to a barrage of anti-Bernie media that portrayed Clinton as the only pragmatic choice against Trump, and argued that Sanders’ combative candidacy would only turn voters off from Clinton in the general election. Sanders ended up winning almost three times as many votes from young people as Clinton (Washington Post, 6/20/18), and raked in record numbers of small campaign contributions. But for the Economist, Sanders’ primary loss signifies that his brand, unsuccessful then, must therefore be unpopular now. But the 2016 primary was two years ago. Since then, Clinton lost an unloseable election to Trump, and his administration’s two years of unbridled corruption have been met with reluctance by congressional Democrats to play hardball, in contrast to the Republican Party’s consistent stance throughout the Obama administration. On some issues, like banking and surveillance, centrist “establishment” Democrats have even voted alongside Trump and congressional Republicans. This weak opposition by the Democratic establishment, along with rationalizations of Clinton’s general election loss and the massive Democratic electoral losses of the past eight years, have caused Democratic voters to shift leftward under the Trump era. If Democrats picked Mr. Sanders, it would not be for his ideas, which have little support within their party, let alone America. It would also be delightful to Mr. Trump, who fancies his chances of destroying “crazy Bernie.” If only for that reason, it is good that Mr. Sanders’ moment in American politics has probably passed. The Economist article underscores an important current in today’s political climate: the reluctance of corporate media to seriously discuss left-leaning policies that provide alternatives to the racist and corrupt policies of the Trump administration, on the one hand, and the pro-corporate, half-compromise policies that the Democratic Party pushed over the past generation, which contributed to Trump’s victory in 2016. The Economist, along with publications such as Politico (5/21/18), USA Today (12/15/17), the New Republic (10/13/17) and the New York Times (10/24/17, 7/6/17), has dismissed not only the legitimacy of Sanders’ policies, but the effectiveness of the candidates he endorses as well. The Economist article quotes an anonymous Democratic strategist as saying that Sanders’ political action group, Our Revolution, “doesn’t do anything” for its candidates, seemingly confirming the magazine’s claim that Sanders’ time has passed. Anonymous sources, of course, are both unreliable and often used as a tool to bolster false narratives. The reality is that candidates backed by Sanders have been winning just about half the time, with a number of such hopefuls winning elections against overwhelming odds, including Philadelphia District Attorney Larry Krasner and Virginia House of Delegates member Lee Carter. What’s more, two high-profile Democratic primary elections swung to Sanders supporters on June 26. In New York’s 14th congressional district, Democratic Socialists of America member and former Sanders campaigner Alexandria Ocasio-Cortez defeated incumbent Rep. Joe Crowley, long heralded as a potential speaker of the House, in a huge upset. Our Revolution candidate Ben Jealous also won the Maryland gubernatorial primary, nominated to face incumbent Republican Gov. Larry Hogan in November in the general. These victories make corporate media narratives that Sanders’ candidates can’t win look like wishful thinking. 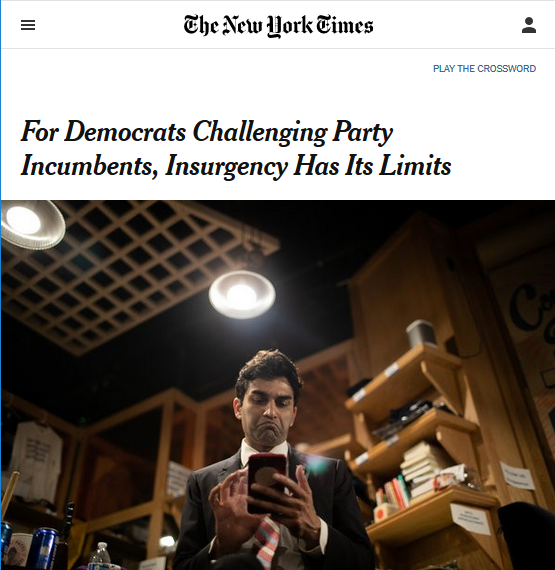 What the Economist and the rest of corporate media miss is that the Democratic Party establishment continues to engage in ongoing suppression of progressive candidates. Democratic House whip Steny Hoyer was caught on tape trying to strong-arm a progressive candidate out of running (Intercept, 4/26/18), while Joe Crowley was accused by Ocasio-Cortez of Election Day dirty tricks. Major Democratic interest groups, such as the pro-choice EMILY’s List, declined to endorse female candidates like Ocasio-Cortez in favor of Crowley, while national Democratic politicians like Kirsten Gillibrand endorsed incumbent New York Gov. Andrew Cuomo over his progressive female challenger Cynthia Nixon. Given that both the 2018 midterm elections and the 2020 presidential election have not yet been held, only time will tell how effective Sanders-endorsed politicians and the Democratic Party as a whole will perform on a large scale. But recent progressive victories show that Sanders’ candidates cannot be counted out, nor have their ideas ignored. Messages to the Economist can be sent to letters@economist.com (or via Twitter @TheEconomist). Please remember that respectful communication is the most effective.